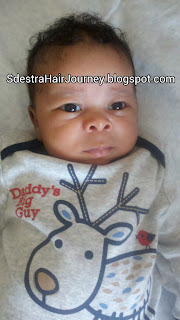 Remember the post I posted months and months ago about growing my son's hair? It was my husband's idea to grow it out. Not mine. I went along with it so I can document his hair journey and thought it would be cute. When were we planning on cutting it? We had no clue and would do it when he had gotten a little older. 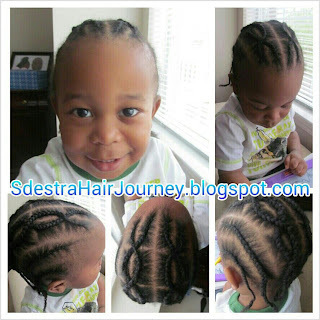 So it was the beginning of his hair journey...I cared for it, braided it, moisturized...basically took care of it to retain length. 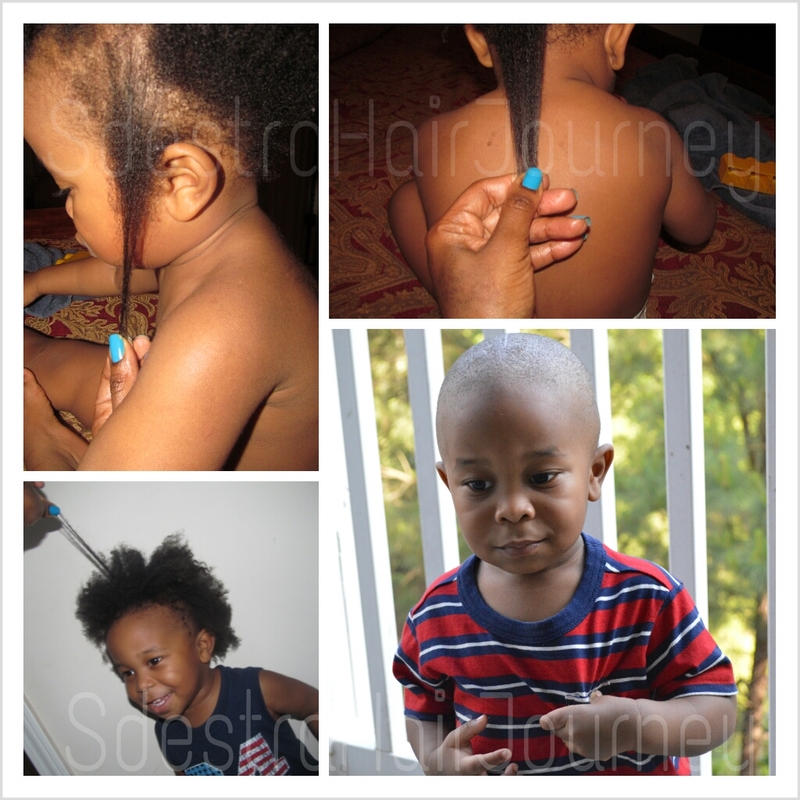 The other day, I took his hair down from a set of cornrows that lasted about three weeks. Usually, I'll give his hair a break for about a week. Wash, condition and moisturize. 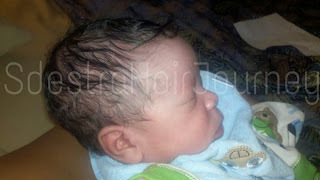 I'll put his hair into two large cornrows to help stretch the hair out for about two days. 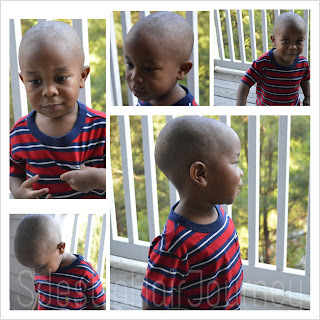 On Sunday, my husband looked at our son and said, "I'm taking him to the barber shop." I paused and had mixed feelings about it. I was starting to get used to doing his hair. 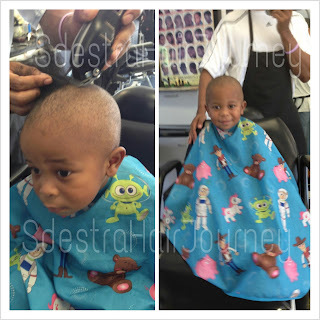 Then I thought that it would be a good thing because he can go out with his father more than usual and have that extra time to bond together when they get their hair cuts. My husband dreaded it because he felt that our son would have screamed his head off and flip out. He told me he have seen from toddlers to young boys around 10 years old in tears. I assured him that he will be fine and is a trooper. Although my son does give me a hard time to braid his hair, I think he would sit still for someone else despite the sound and feeling of the clippers on his head. And recently, he had his teeth cleaned at the dentists' office and did not flinch nor cry. The first thing I noticed was his face! He was smiling and did not have a look of distress. Then my husband called me, raving about how our son sat there and did not cry. Then went on saying that he sat there and smiled the whole time. Far from what he expected. So, the hair is gone. The hair growth journey has ended and I am perfectly fine with it. Did I cry? Absolutely not. May be it would have been different if I was at the barber shop. But I was happy and knew that dealing with one less head of hair would be more appealing and a relief. Interesting to see how he is a big boy now...it's official and he went from being a toddler to looking like a boy as if he went through a rite of passage into becoming one (laughing). 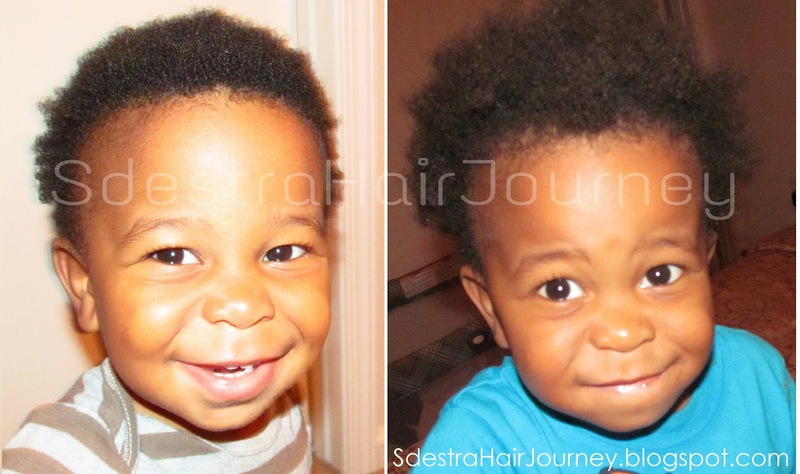 Thanks so much for reading and here are a few more photos showing his hair from the time he was born to now with his hair cut. We'll chat again soon! Okay, so the post was not actually late, but I had it scheduled to post yesterday and it never did. I must have done something wrong? I am so sorry that it happened. I so was excited about the post too. But it is better late than never! 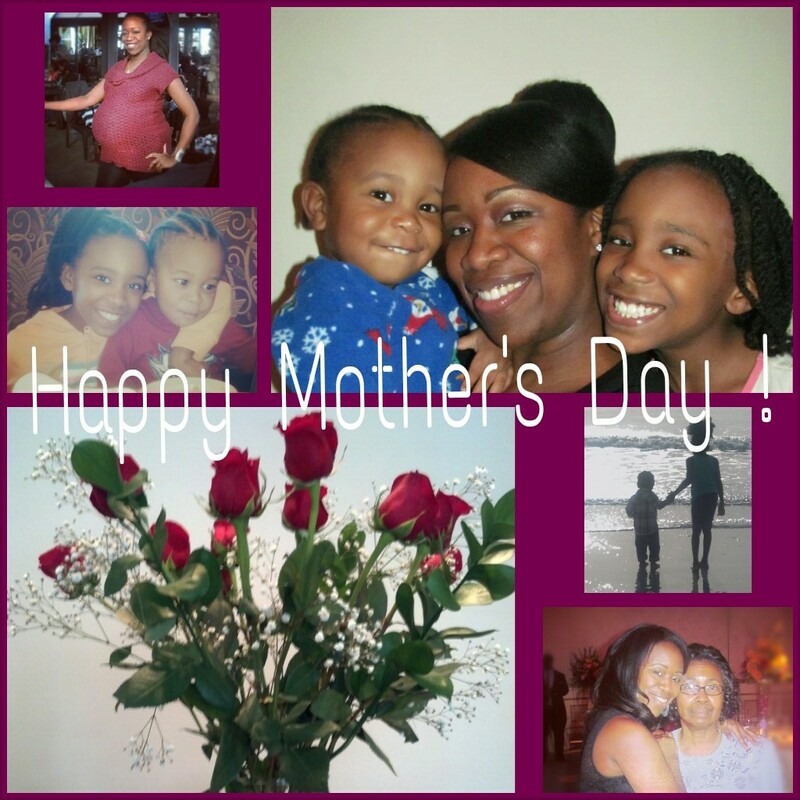 I want to wish you all and hope you had a wonderful Happy Mother's Day! Whether you are a mother, mother that adopted, step mother, or played a "motherly" role in someone's life...Happy Mother's Day. Here is a video I posted yesterday along with some of my wonderful friends who contributed to do this with me! These wonderful ladies were more than eager to participate and from me to them, I thank all of them for sharing a piece of themselves. These friends are relatives, bloggers, youtubers and/or followers. I did not expect so many to share, but it did overwhelm me with emotion as I received the photos and videos since they were all beautiful and sincere. Again, Happy Mother's Day and remember that it is celebrated every day through love, dedication, care and our personal teachings that we share and give our children. It is about that time again for this season and school-end events (recitals, weddings, proms, formals) for many of our children. For me, it is my daughter's dance recital. She has been dancing for 4 years now and absolutely loves it. This year, she will be in four different dance routines during the recital in June. This week, was their professional photo shoot and that meant her hair had to be styled into a mandatory bun. Each year, the requirement is to have the child's hair in a bun (for girls). For some parents, it may be a challenge to do this depending on the hair the child has. There are many tools that cater to buns. Such as the donut foam, sock bun, and other hair bun making tools. Not everything works for every one and here are some reasons why: short hair, fine hair, thin hair, thick hair, long hair. 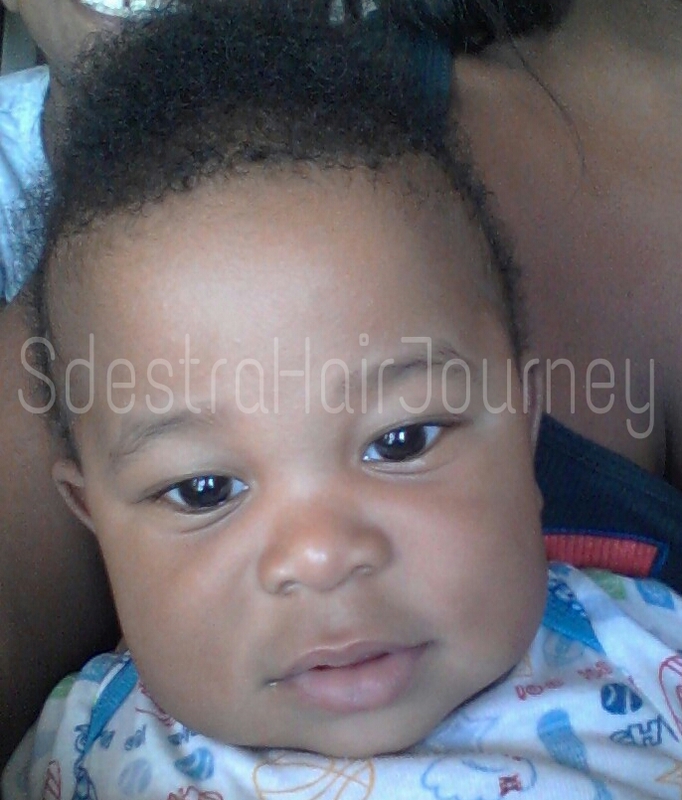 Depending on the hair, you need to have something to accommodate what needs to be achieved. 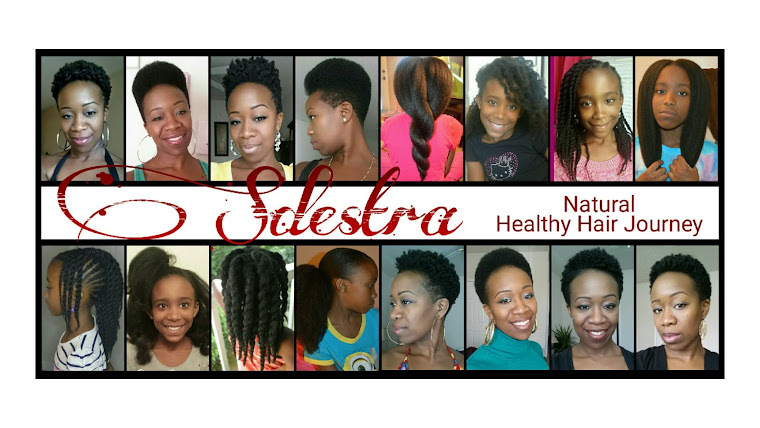 From talking to several parents of all races that bring their to the same dance schools, many face various challenges: coarse hair, short/thick hair, long/thick hair, layered hair, long/thin hair, short/thin hair, curly hair....so many! MadiMel has thick, coarse and dense hair. 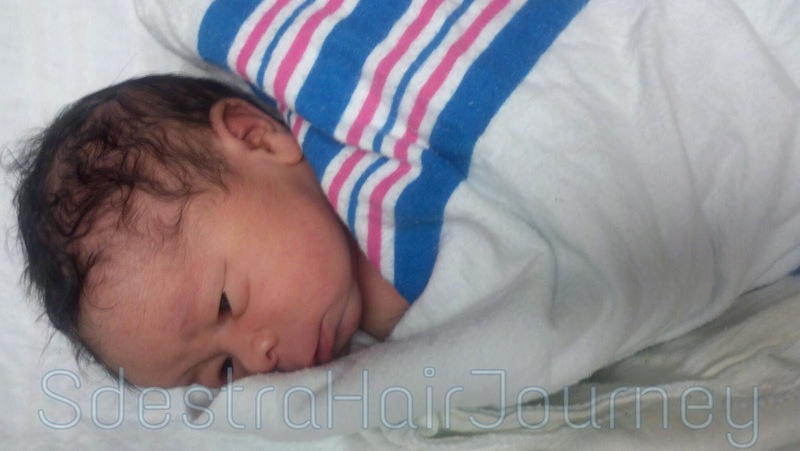 Her hair is mostly coily and a small area where it is a little loose with small waves. Straightening her hair could have been an option, but I choose and chose not to do that. From the years since she has been dancing and received the hair style requirement, I have never used heat but opted for another option. Going heatless. If she already had a style on her hair such as cornrows and/or twists, I simply take her hair down (after each twist and cornrow), finger detangle and then use a Denman brush to make the hair more manageable. Considering that her hair was previously styled, her hair would be more likely be stretched out. Less work but just detangling that would consume my time. If I shampooed or cowashed, towel dry as much as I can, put her hair into 4 jumbo twists/plaits or loose french braids to let it airdry after moisturizing it. 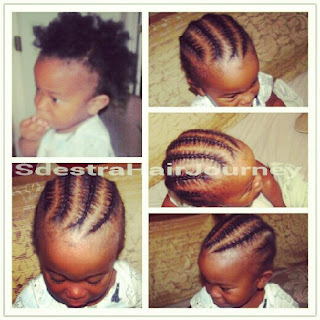 That also helps to stretch the hair (other ways: conrows, twists, banding, african threading). Once her hair is dried, I take her hair down. Her hair is a bit more stretched where it becomes manageable and takes so much less time to style. 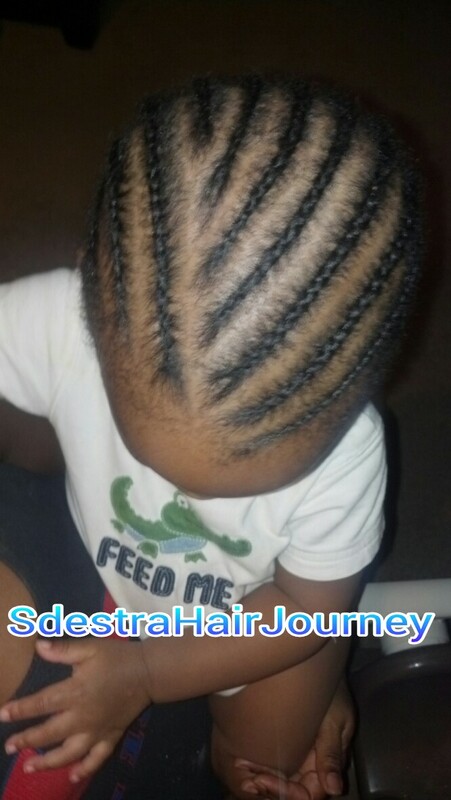 And again, I also make sure her ends are well moisturized since that part of the hair, the ends, are the oldest and vulnerable to dryness. 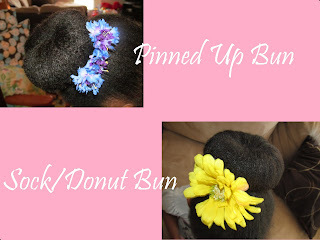 Here is a video on the bun I do on her hair for her recital (and other times). The video was recorded back in Spring 2012. Since it is the time for various events, several people had asked me for a video like this. I thank you! We'll chat soon and have a blessed and wonderful weekend!